Summary: The Greater Journey is the enthralling, inspiring—and until now, untold—story of the adventurous American artists, writers, doctors, politicians, architects, and others of high aspiration who set off for Paris in the years between 1830 and 1900, ambitious to excel in their work. When my daughter asked me to review THE GREATER JOURNEY: AMERICANS IN PARIS by David McCullough I was pretty excited since McCullough’s THE JOHNSTOWN FLOOD, TRUMAN and JOHN ADAMS are three of my favorite books. To me, THE GREATER JOURNEY did not rise up to the level of these three novels, but was still an excellent book. The novel covers the period from 1930 until the turn of the century when many Americans in art, education, literature, music, medicine and science traveled to Paris seeking experiences and inspiration not available in the United States. As a perspective, during this period the United States was dealing with the Indian Wars and later the Civil War. McCullough pieces together a collection of stories and characters that brings Paris to life during this 70 year period. The author shares with the reader stories about many Americans who came to Paris but the main character of the story is the city of Paris. McCullough tells of the beauty of Paris in the spring and how Paris was transformed politically, economically and socially during that 70 year period. The reader gets to learn of the difficulty of the survival of Paris during the Franco-Prussian War and the destruction of the Paris Commune which politically controlled Paris for a brief period in 1871. The reader is entertained with the stories of the Louvre, the Eiffel Tower and the Statue of Liberty and gets a feel of the importance of Paris as a world city. The first American travelers to Paris were young ambitious men but in time many women followed. McCullough tells great stories about Mary Cassatt, a great impressionist painter; Elizabeth Blackwell, the first American female doctor; Margaret Fuller, a feminist and the first American professional writer to visit Paris; Emma Willard, a schoolmaster; and Harriet Beecher Stowe, trying to escape from her fame in the United States. Some of the more interesting stories of men in the book include Oliver Wendell Holmes, Sr. who brought to the U.S. techniques from Paris that revolutionized medicine; Samuel Morse, a painter turned inventor; August Saint-GaudensWashburne, U.S. Ambassador to France whose diary provided significant details about the suffering in Paris during the Prussian siege. There were also interesting accounts of visits to Paris by Mark Twain, P.T. Barnum and Tom Thumb, and Buffalo Bill Cody’s Wild West Show. 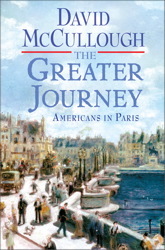 Although the book is about Americans in Paris, McCullough includes famous French characters like Marquis de Lafayette, hero of the American Revolution; King Louis-Philippe, who traveled the United States extensively during his exile and Prince Louis Bonaparte, ruler of the Second Republic. In THE GREATER JOURNEY McCullough does a brilliant job of piecing together various unconnected stories of famous Americans in Paris by placing the characters within the history of Paris. Through his detailed research and entertaining writing style McCullough helps the reader understand the influence of Paris science, medicine, music, literature, education and art on the United States. If you are interested in understanding the influence Paris had on America and in learning about the struggles and achievements of several Americans who traveled to Paris in the nineteenth century to fulfill their dreams, then you should read THE GREATER JOURNEY. Thanks to the publisher for sending a copy of THE GREATER JOURNEY and for Booking Pap Pap for his insightful review. The subject of this book sounds very interesting to me, but I have to admit to being somewhat intimidated by McCullough's work. This does sound good. I have not liked the two McCullough books I read previously, but this one sounds better!